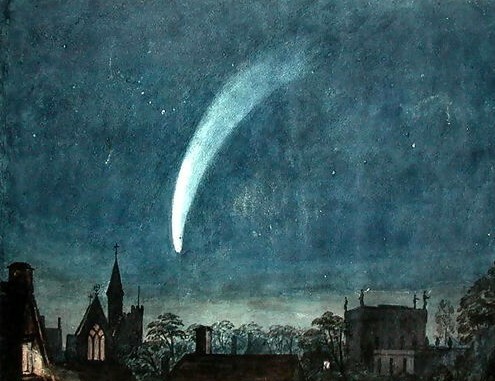 In the late summer of 1858 a ‘Great Comet’ appeared which was so bright it could easily be seen in broad daylight; people were awed by it, artists painted it and the great astronomers of the day tried to photograph it. 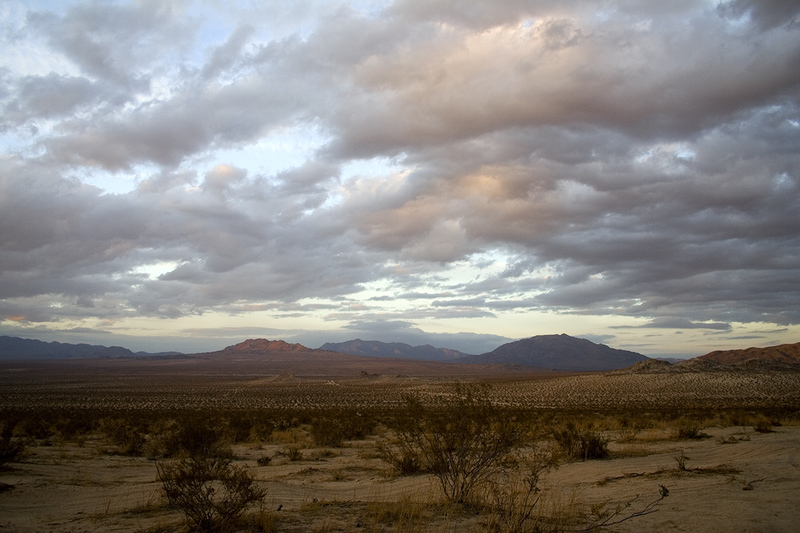 The famous Astrophotographer, Warren de La Rue attempted to capture it and failed. George Phillips Bond (1825-1865), the son of the Director of the Harvard College Observatory, even succeeded in photographing it on the 28th of September of that year. 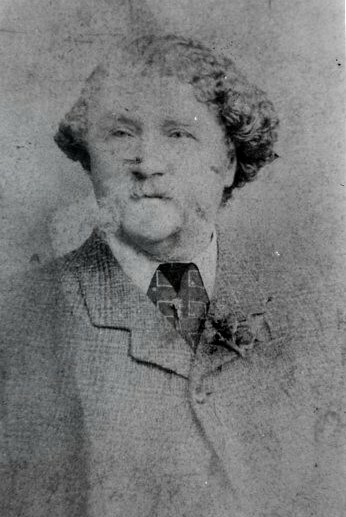 However he would later find out that he was beaten to it – by a single day, and therefore lost his claim of being the first person ever to photograph a Comet. So which of the great observatories with their large telescopes claimed this remarkable feat as theirs:Greenwich, Berlin, Paris or St. Petersburg? And who was the astronomer whose name would live forever in the annals of the History of Photography - Sir George Airy, the Astronomer Royal; or Johann Galle, the discoverer of the Planet Neptune; or Giovanni Battista Donati (1826-1873), the comet’s discoverer? It was none of them! The honour went in fact to - William Usherwood, an unknown miniature artist and commercial photographer from Walton-on-the-Hill, Surrey, England. Yet his name like the object he photographed shone brightly for a while, before disappearing into the dark depths of space and time. So why did William Usherwood, with the aid of the camera he used for photographing babies and weddings succeed; whilst Bond with the ‘Great Harvard Refractor’ at his disposal only managed a photograph of the comet, which he himself admitted was poor and a day too late? William Usherwood’s story, begins not on Walton Common where he captured the light of an object which man had not seen since the time before Rome ruled the known world; or at Dorking where he lived for a good part of life, but in the streets of the old parish of St. Marylebone in the old county of Middlesex, where he was born. 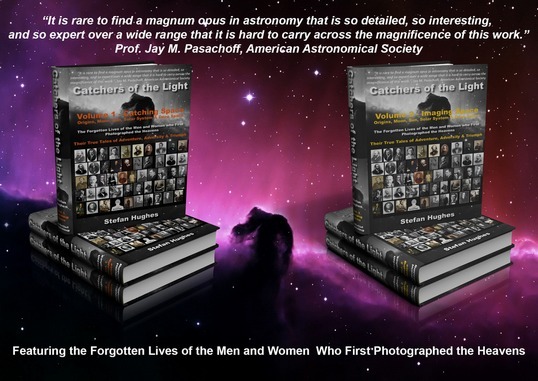 To read more on his life and work and the other early pioneers of amateur Astrophotography, read the eBook chapter on William Usherwood or buy the eBook or Printed Book at 'Catchers of the Light'. Comet Donati by William Turner (1789-1862) of Oxford. Stefan Hughes began his career as a professional astronomer, gaining a 1st Class Honours degree in Astronomy from the University of Leicester in 1974 and his PhD four years later on the 'Resonance Orbits of Artificial Satellites due to Lunisolar Perturbations', which was published as a series of papers in the Proceedings of the Royal Society of London. After graduating he became a Research fellow in Astronomy, followed by a spell as a lecturer in Applied Mathematics at Queen Mary College, London. Then came a ten year long career as an IT Consultant. In 'mid life' he spent several years retraining as a Genealogist, Record Agent and Architectural Historian, which he practiced for a number of years before moving to the Mediterranean island of Cyprus, where for the past ten years he has been imaging the heavens, as well as researching and writing the 'Catchers of the Light' - A History of Astrophotography. Unknown Theme by Free CSS Templates modified for use with BlogEngine.NET 3.3.5.0 by MGD King.